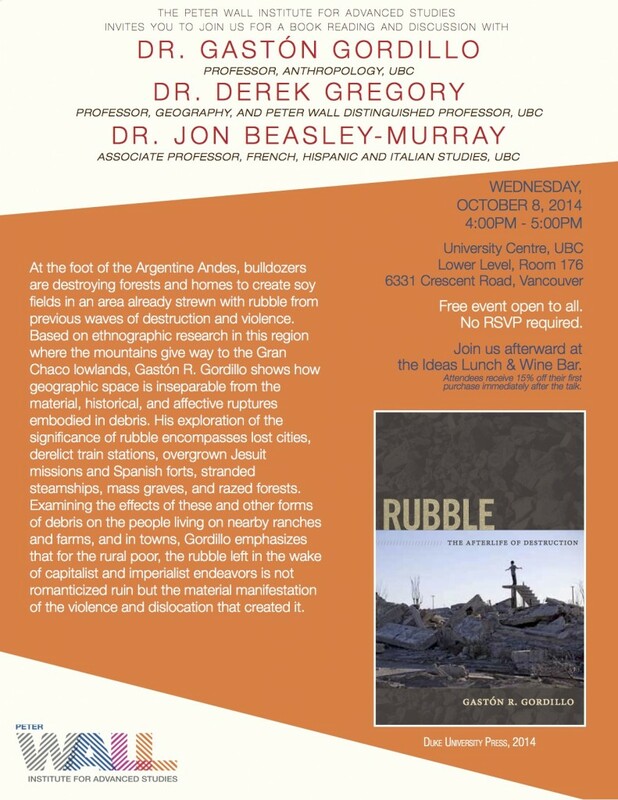 As a part of the Ideas Lunch & Wine Bar’s Wall Wednesdays Afternoon Series, the Peter Wall Institute for Advanced Studies is having a book reading and discussion with Dr. Gaston Gordillo, Dr. Derek Gregory and Dr. Jon Beasley-Murray, featuring Dr. Gordillo’s new book, Rubble: The Afterlife of Destruction. At the foot of the Argentine Andes, bulldozers are destroying forests and homes to create soy fields in an area already strewn with rubble from previous waves of destruction and violence. Based on ethnographic research in this region where the mountains give way to the Gran Chaco lowlands, Gastón R. Gordillo shows how geographic space is inseparable from the material, historical, and affective ruptures embodied in debris. His exploration of the significance of rubble encompasses lost cities, derelict train stations, overgrown Jesuit missions and Spanish forts, stranded steamships, mass graves, and razed forests. Examining the effects of these and other forms of debris on the people living on nearby ranches and farms, and in towns, Gordillo emphasizes that for the rural poor, the rubble left in the wake of capitalist and imperialist endeavors is not romanticized ruin but the material manifestation of the violence and dislocation that created it.